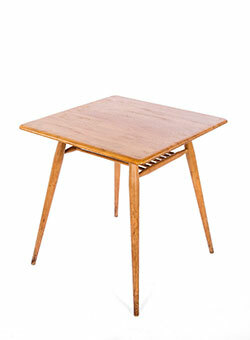 Ercol furniture is as stylish today as it was when it was first created in 1920 by Lucian Ercolani. The enduring popularity of original pieces of Ercol furniture has resulted in rising demand for repair and restoration projects from our clients, who understand that classic modern designs require the same level of attention and craftsmanship when they are damaged as do older antiques. Until relatively recently Ercol had a list of preferred agents for Ercol furniture restoration (of which we were proud to be one), who were required to demonstrate their knowledge, expertise and skill to the company before becoming accredited to undertake restoration and repair work. As this quality control mechanism no longer exists there has been an increasing number of contractors who are offering Ercol owners their services without the necessary understanding or experience to achieve the required results. At Ludovic Potts we use traditional Ercol furniture restoration skills to restore ageing and damaged furniture to its former glory. If you would like to see an example of our close relationship with Ercol, please read this article on our restoring Ercol furniture project for the Sir Ralph Perring Centre. The history of Ercol is fascinating and www.ercol.com is well worth a visit if you are interested in exploring how its large range of furniture styles developed over the years. Over the years we have taken the same approach to restoring modern furniture finishes as we have with traditional finishes. We work using original materials as closely as possible and in this instance we wanted to achieve a long durable finish with ease of maintenance. We used modern lacquers which are hard, durable and easy to maintain by wiping and drying thoroughly. This Ercol dining table had been in use from the mid 1960’s yet had plenty of life left in it, despite the finish which had deteriorated. Our objective was to remove the original damaged finish down to the bare wood and re-lacquer it, bringing it back to showroom condition as required by the client. On occasion we are asked to retain sentimental damage which has occurred over the years – for example “Little Johnny” aged three may have signed his name with a ball-point pen! Retention of such damage is not an issue and is easily accommodated. We are often asked to repair Ercol dining chairs and tables which have begun to move and creak. In many cases the only practical and lasting repair option is to fully dismantle the item in our specialist workshop, where it will be photographed at every stage of the repair for the client. Each section will be labelled, so that it can be put back together exactly as it was. The old glue on each individual joint will be cleaned off before the sections are dry fitted, then re-glued with the appropriate glue. In the majority of repairs we use a high quality PVA glue which gives strength, whilst allowing slight flexibility and movement. Chairs are then clamped, forcing the excess glue out of the joints, which is then removed. Some chairs may have broken components e.g. legs, spindles or arms. 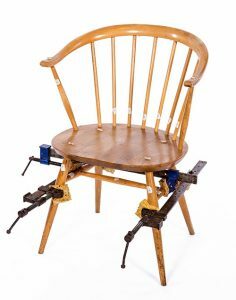 Individual parts can be replaced, using either original Ercol parts (if still available), or we can manufacture these ourselves. 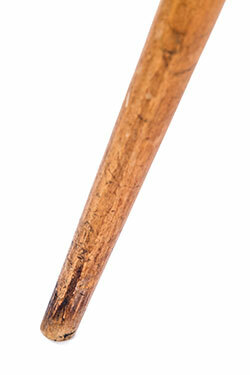 Prior to refinishing we steam off bruises and scuffs and remove any marks on the bottom of the feet. In order to return furniture to its original showroom condition we strip the original polish off using chemical based strippers within a controlled workshop environment to ensure the correct air circulation. The next process is rubbing down, which neutralises the chemical process involved in dissolving and removal of the original finish. The subsequent re-polish in a clear spray lacquer produces a hard, durable, and beautiful finish which can be maintained by simply wiping clean. We are also frequently asked to revive much loved older pieces of Ercol furniture such as dining tables or sideboards which have been water marked, heat marked or scratched over years of constant use. Table tops were generally made of elm, table bases and framework in beechwood. On arrival at our workshop we photograph the item before removing the original polish down to the bare wood, as well as removing any surface stains and scratches and staining where appropriate. We then neutralise, followed by sanding. The polishing is matched to the original unless otherwise specified. We have, on occasion, changed and lightened items from a tinted finish to a natural finish for clients. This service is available across all items of Ercol furniture. We are always happy to receive images to discuss options available.